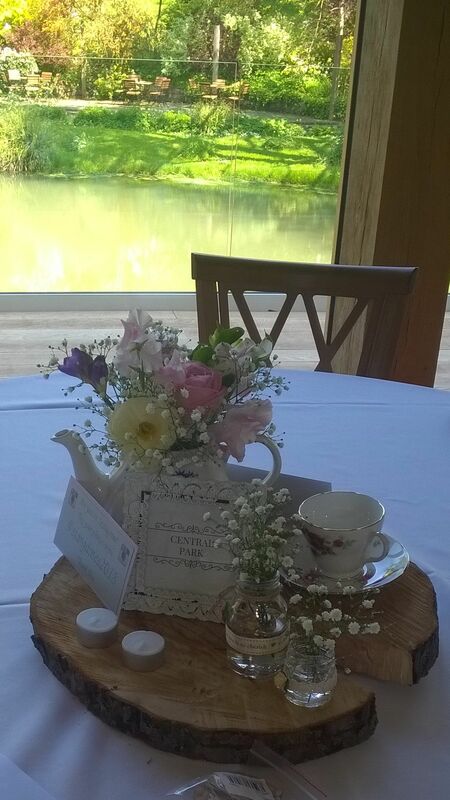 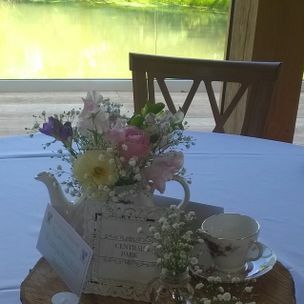 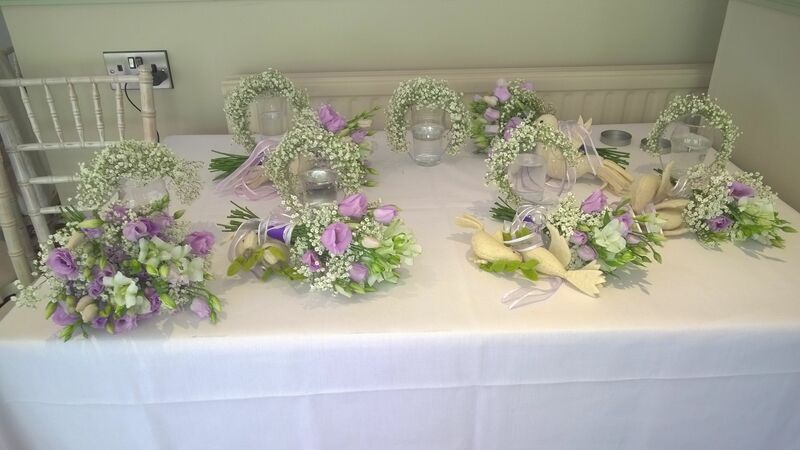 At Orchids Corner we have travelled all over the UK to help our brides create the wedding of their dreams . 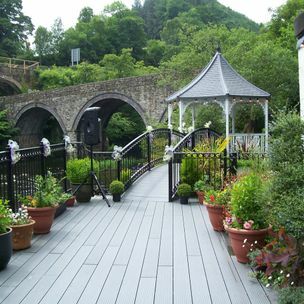 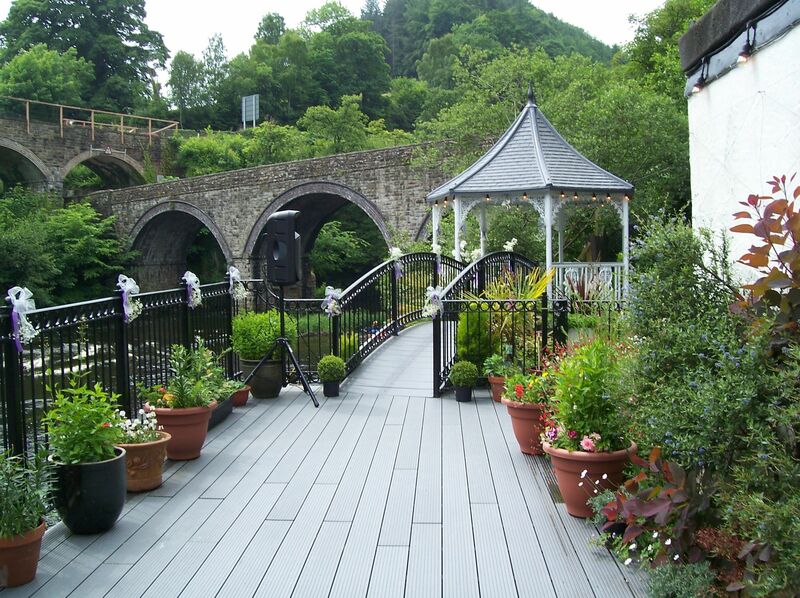 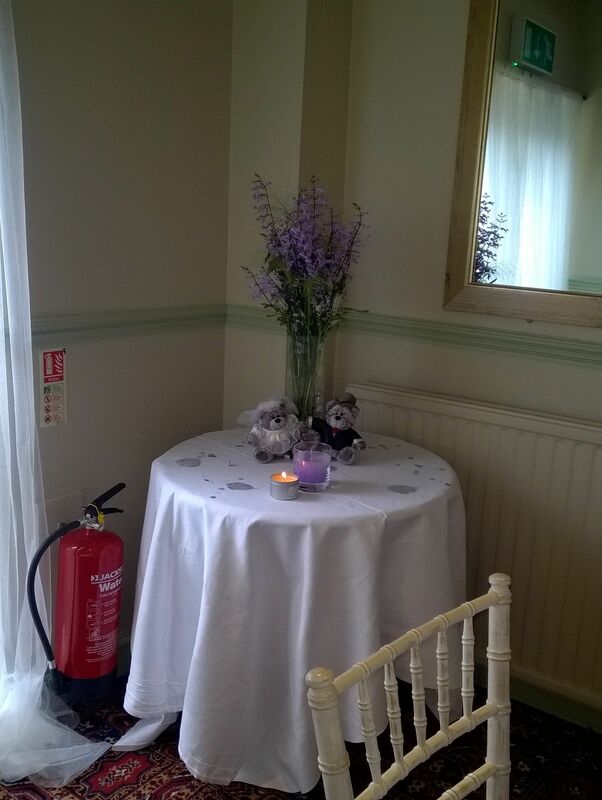 we will travel to your chosen wedding venue . 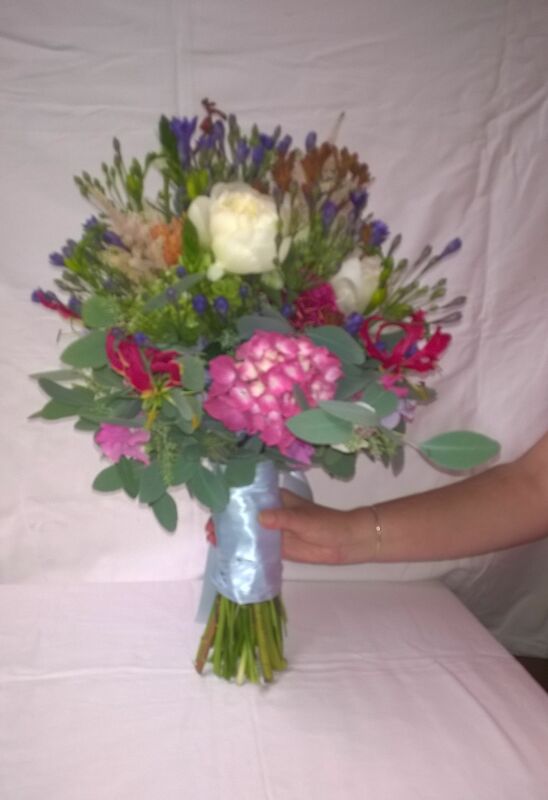 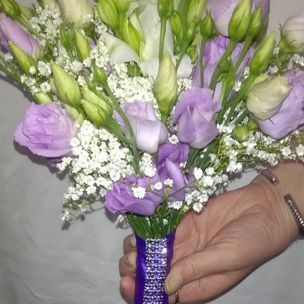 July Bride who wanted her wedding bouquet a little different . 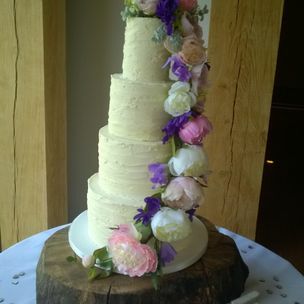 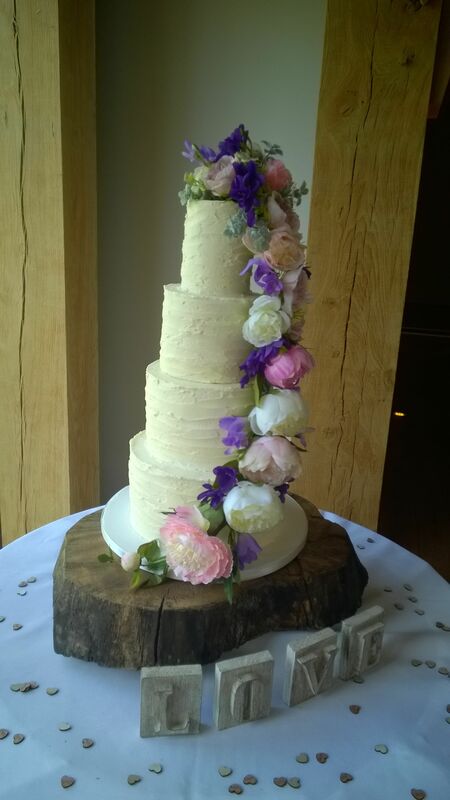 This bride explained that her wedding theme is all about natural , textures , shapes , smells and vibrate colours . 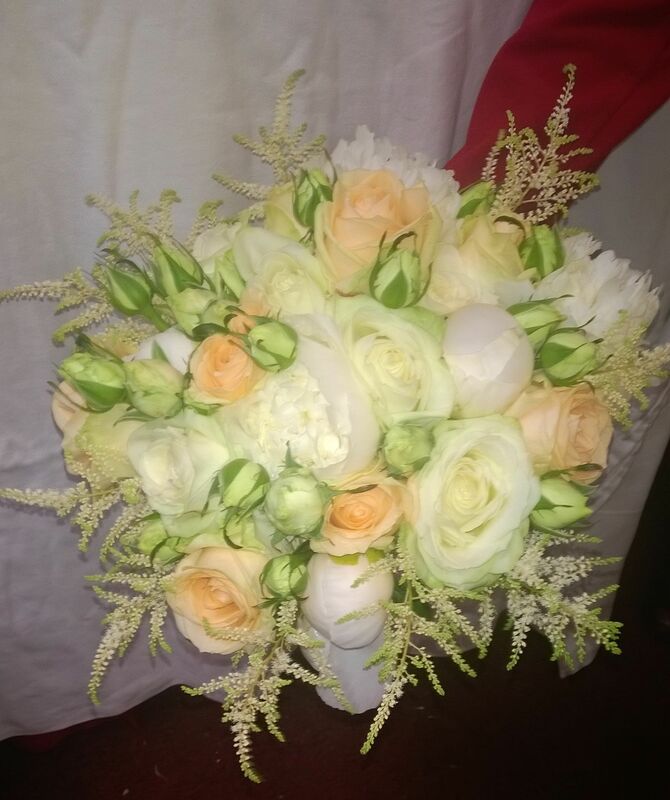 Each side when you looked at her wedding bouquet was a different look and the scent from her flowers was delicate but divine . 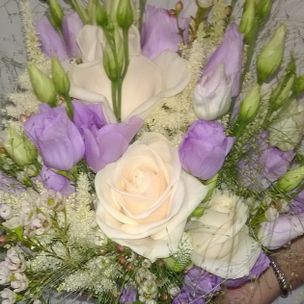 What this bride was looking for is that every time she would smell the flowers that was in her wedding bouquet , it will always remind her of her wedding day . 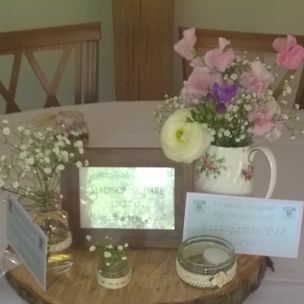 This Bride explained that she would be getting married in Wales . 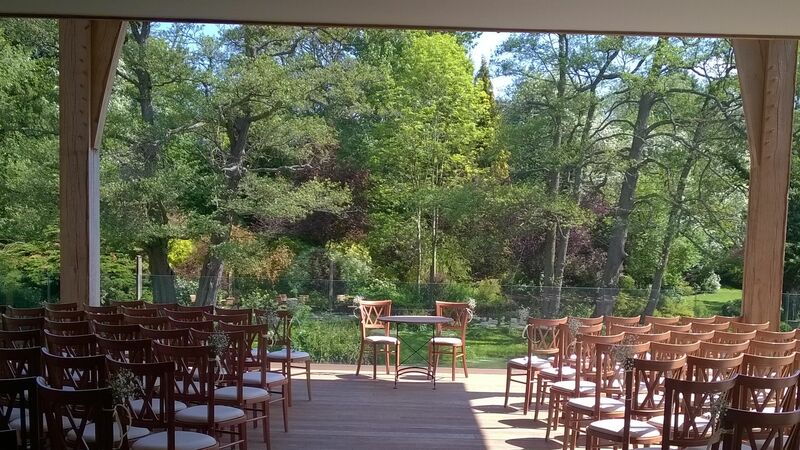 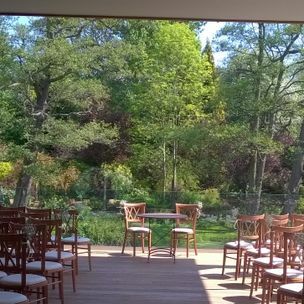 The wedding is taking place at the wedding Venue with beautiful setting . 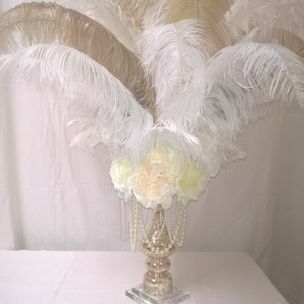 Her wedding theme she is looking for is the natural , elegant and classy look . 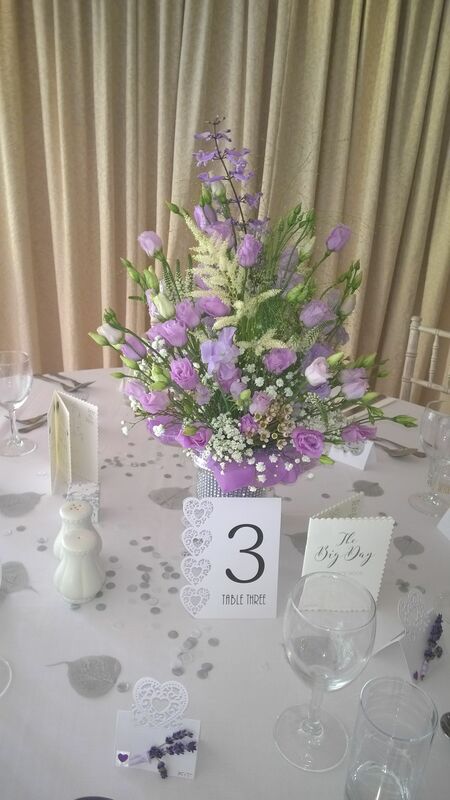 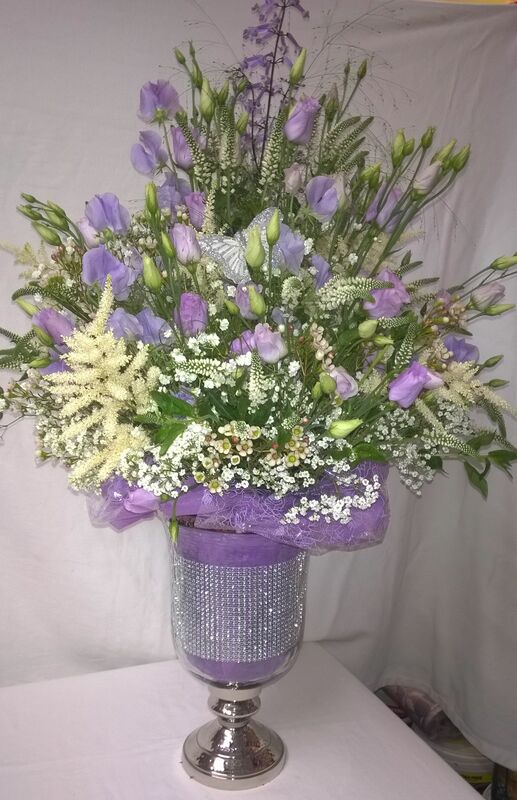 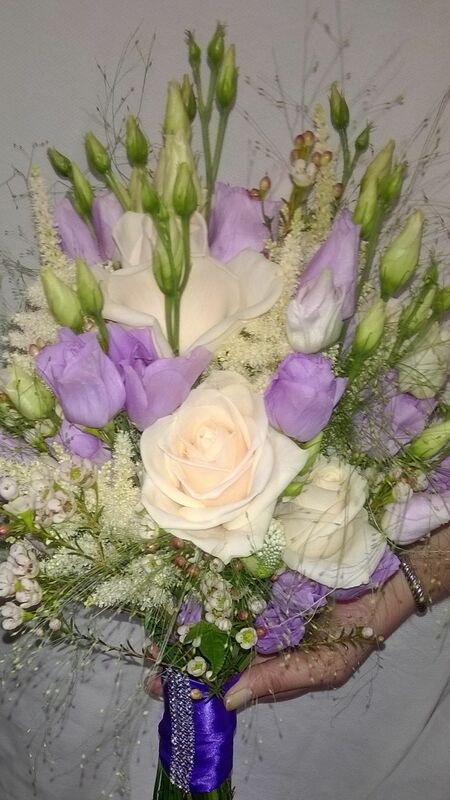 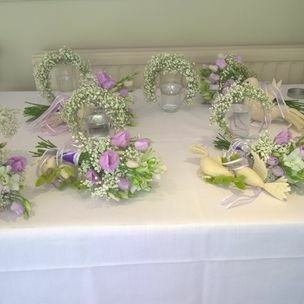 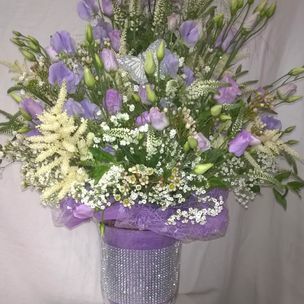 Wedding colours are lavenders , slivers , ivory with a hint of purple . 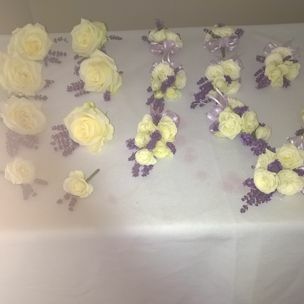 The bride also loves gyp , bows , ribbons with trails , birds , butterflies , Bling and asked if we could some how , include some sparkle . 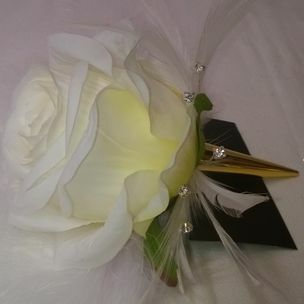 Also the bride was looking for a different look on the evening from the day time , that is when lights were included too . 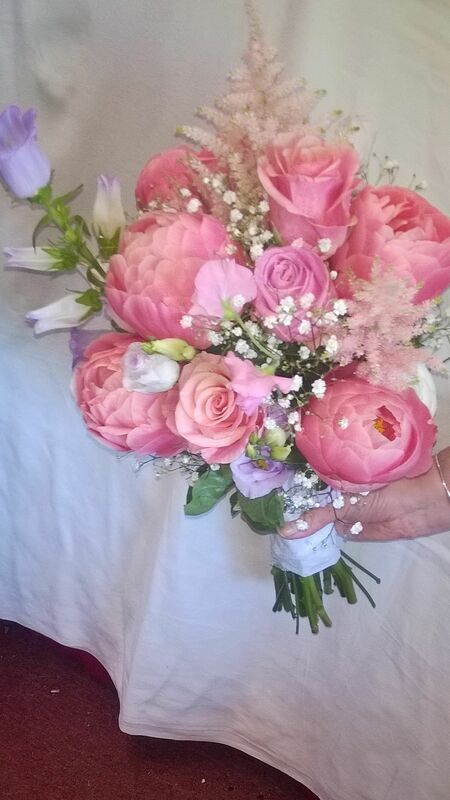 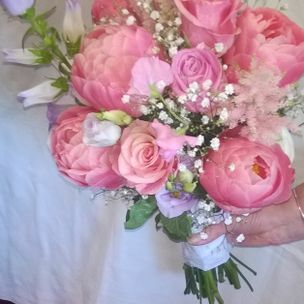 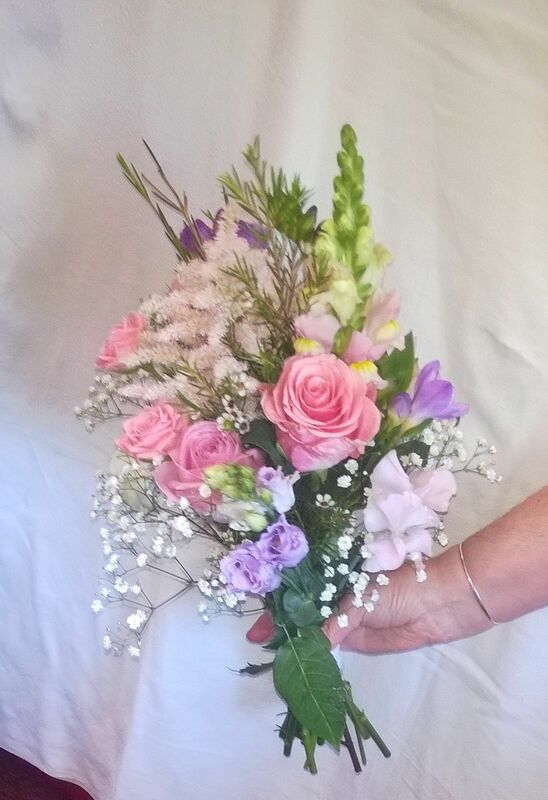 Having 6 bridesmaids all of different ages and sizes , their flowers needs to be simple and the right size for the girls ages . 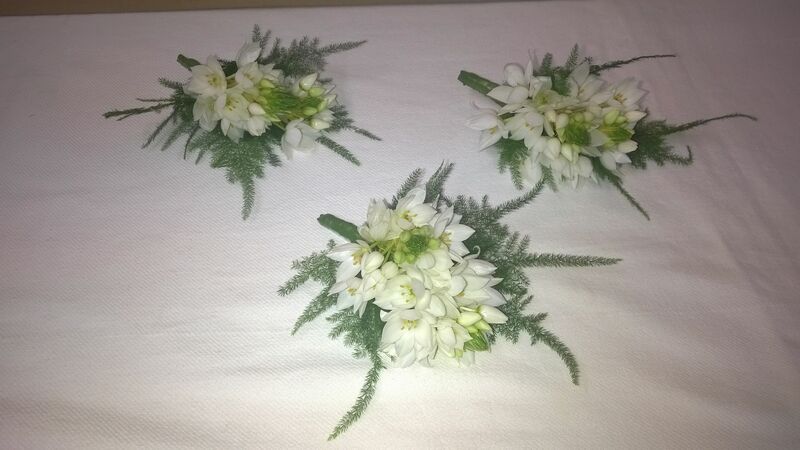 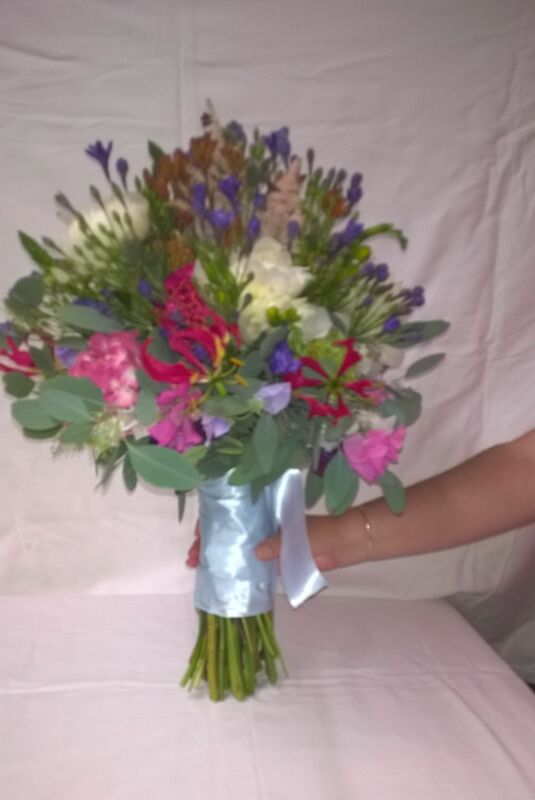 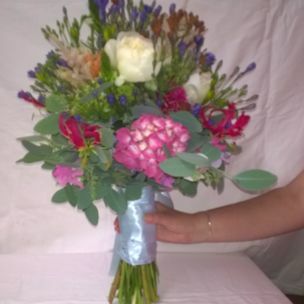 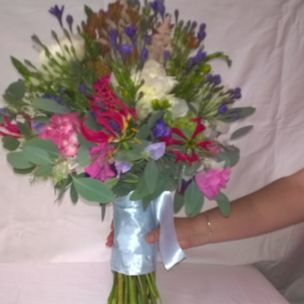 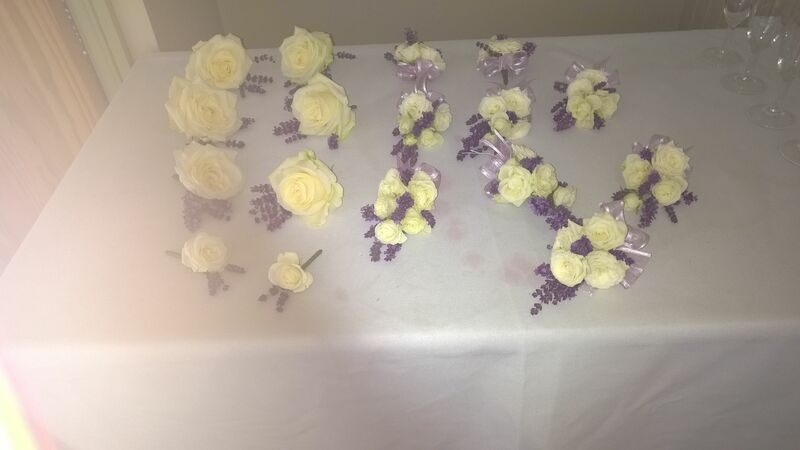 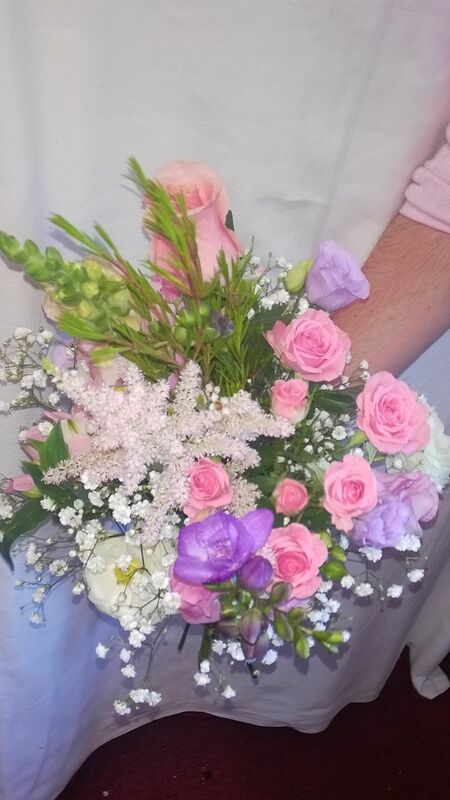 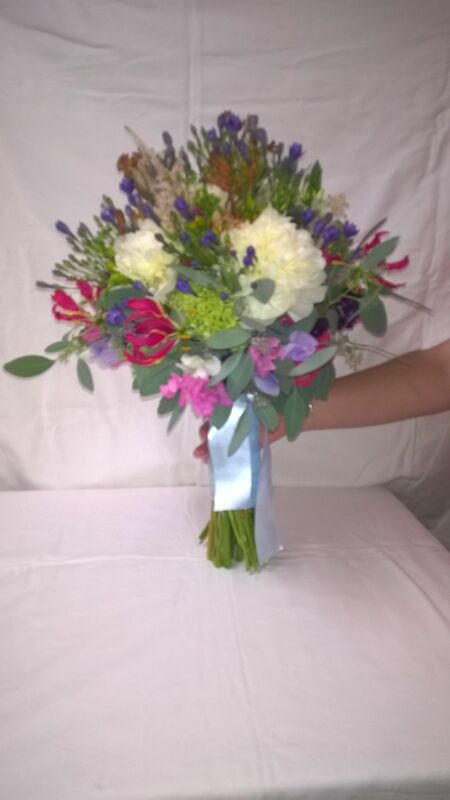 They also needed flowers for their hair , nothing too heavy , children friendly . 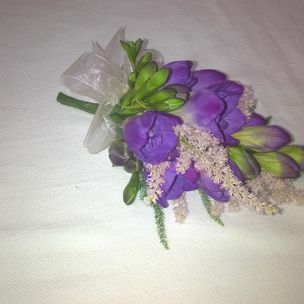 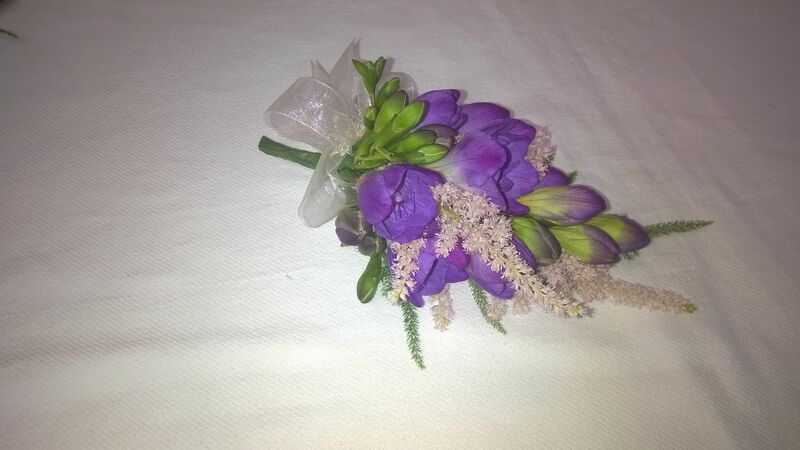 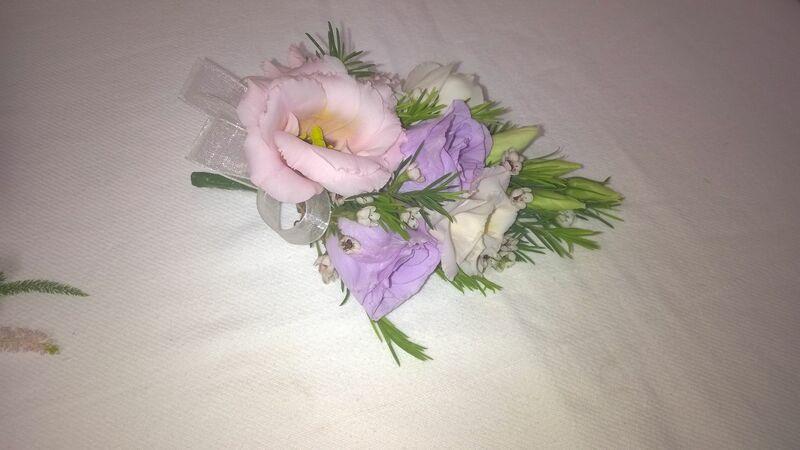 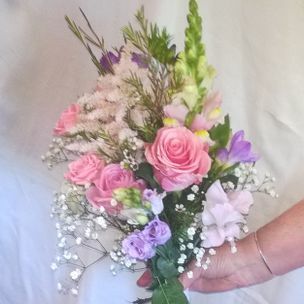 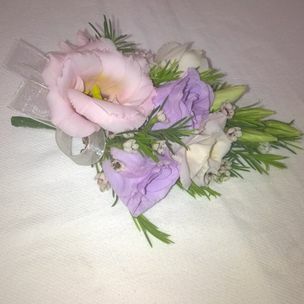 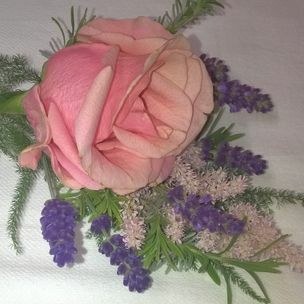 Needing button holes for the men and corsages for the ladies nothing too big or heavy , as well as a few little button holes for the young boys . 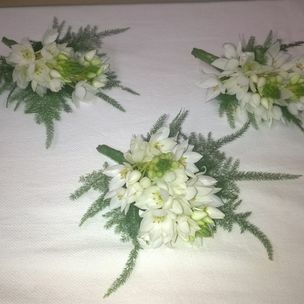 At the wedding venue The walk to where the wedding ceremony will take place being outside , needed to dressed up by using flowers and bows . 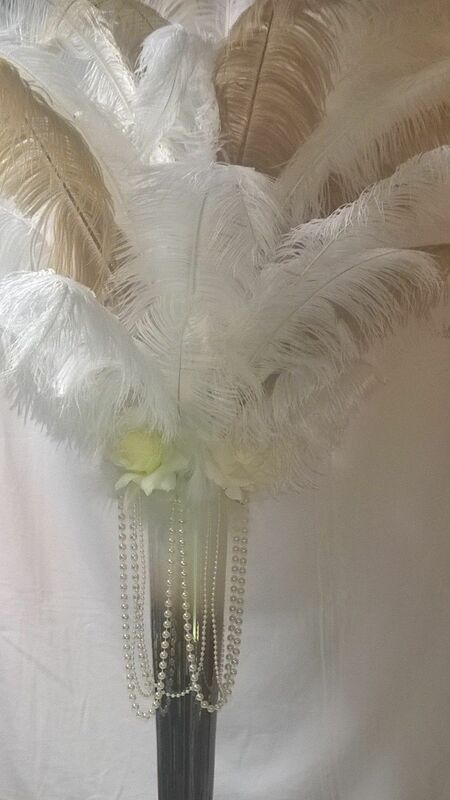 The Gatsby Wedding Theme , with a twist . 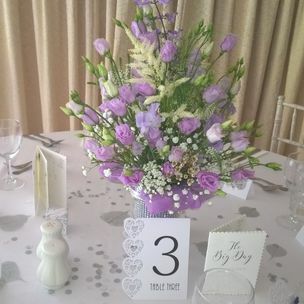 The Bride explained that she would be getting married in a marquee in the back of her garden located in Worcestershire . 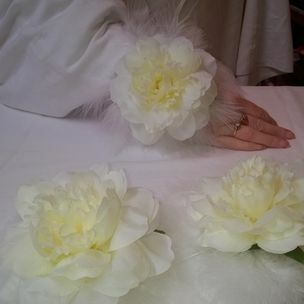 May Bride she liked silk flowers and her table displays , she will place them in her home afterwards . 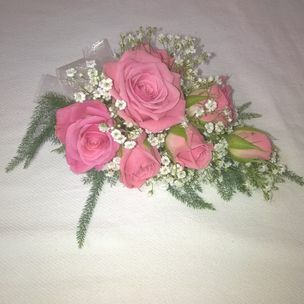 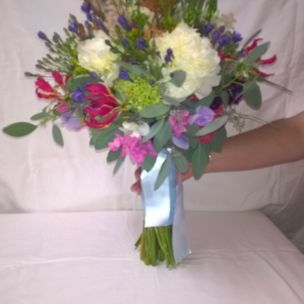 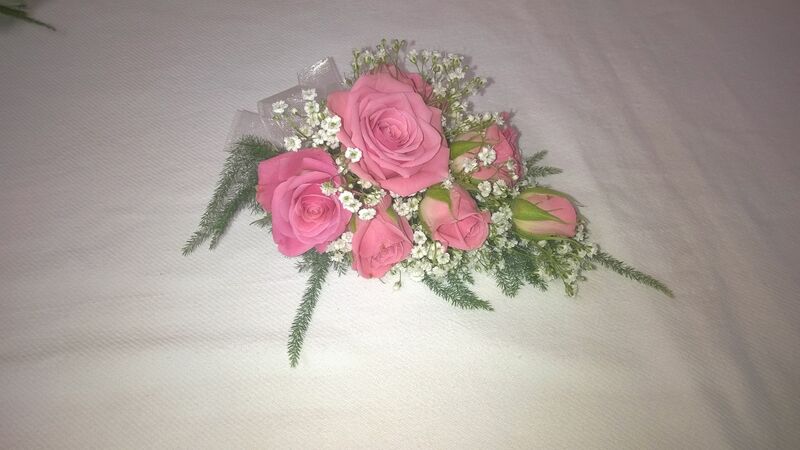 But it is a must for her wedding bouquet to be in fresh flowers . 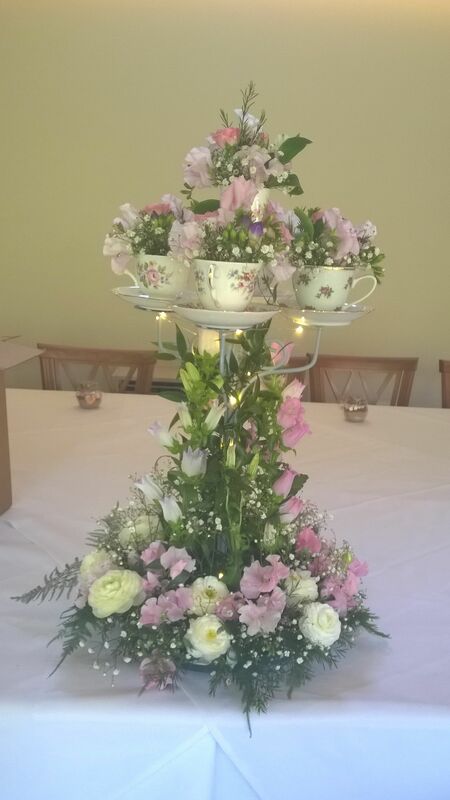 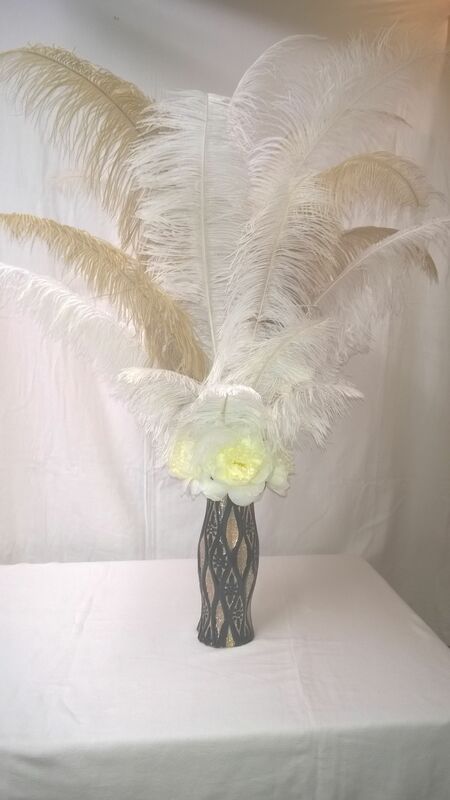 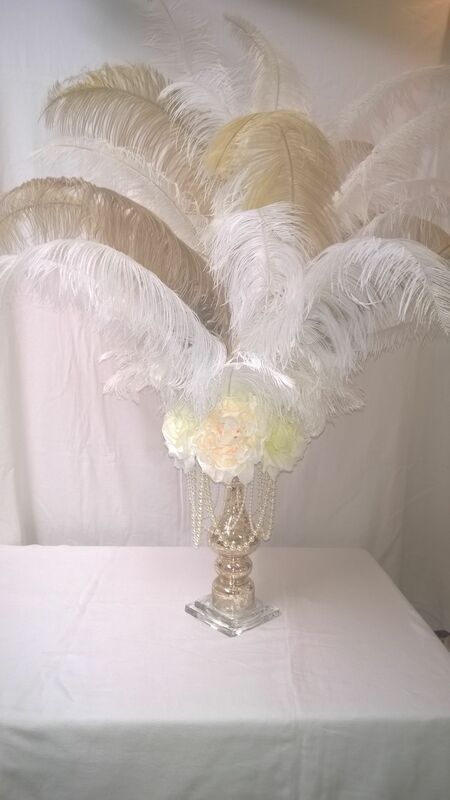 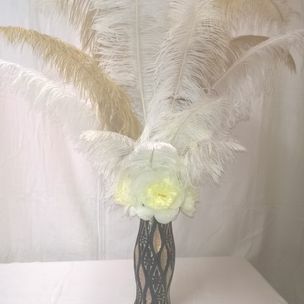 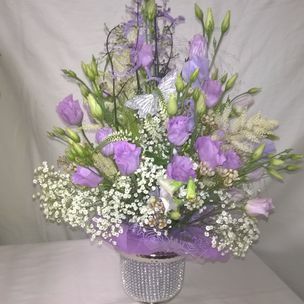 The Bride and Groom wanted the table displays to look bang on the era 1930 , with tall , slim , with large feathers , pearls draping down , silk realistic flowers , bling ,something eye catching and because the arrangements will be placed in their home afterwards we needed different looks . 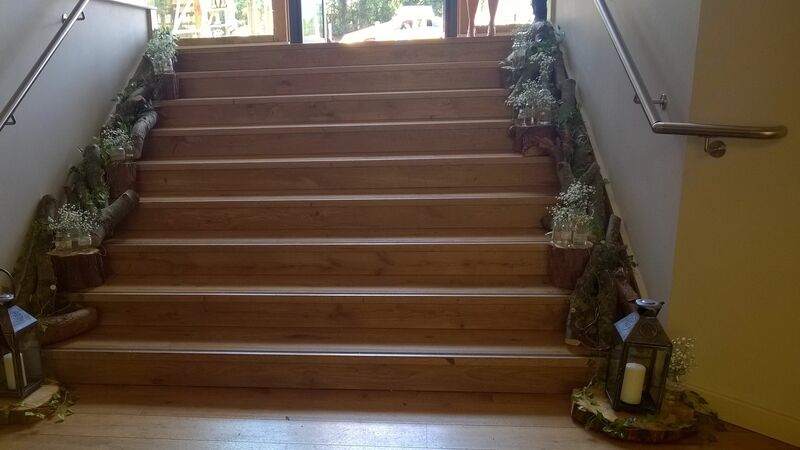 Not 8 all the same. 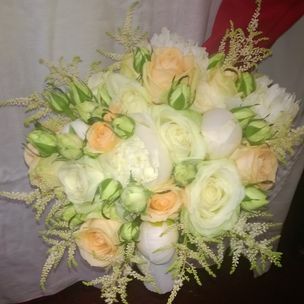 The wedding colours Ivory , soft peach , golds with hint of black . 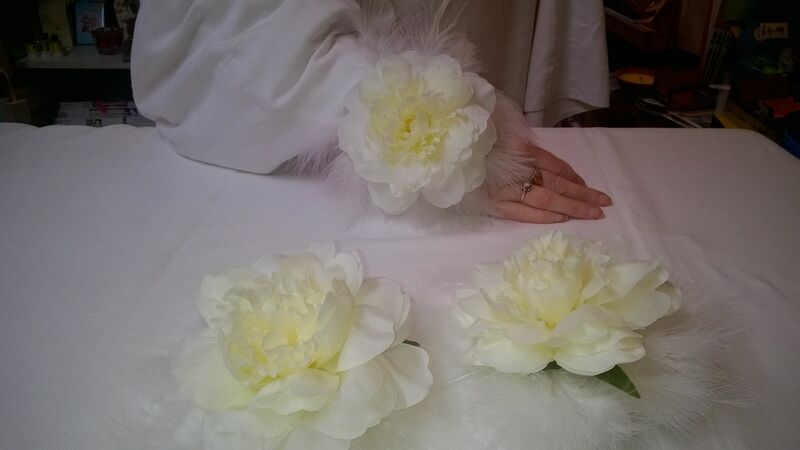 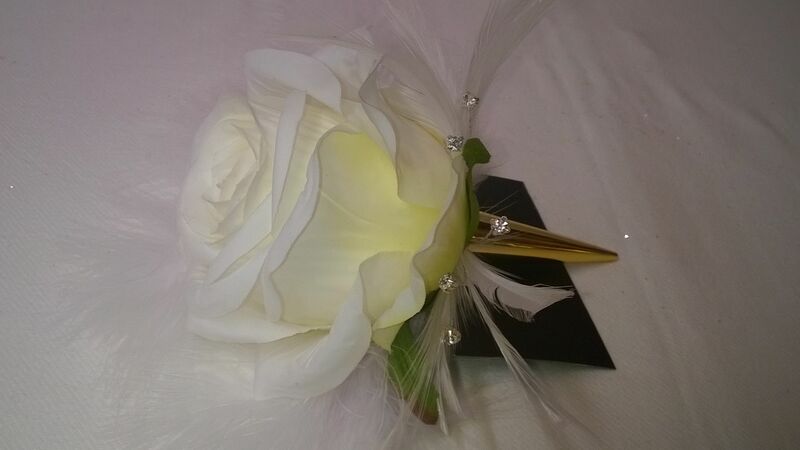 4 Adult bridesmaids which they all wore a single silk peony flower with feathers , wrist corsage on a pearl bracelet . 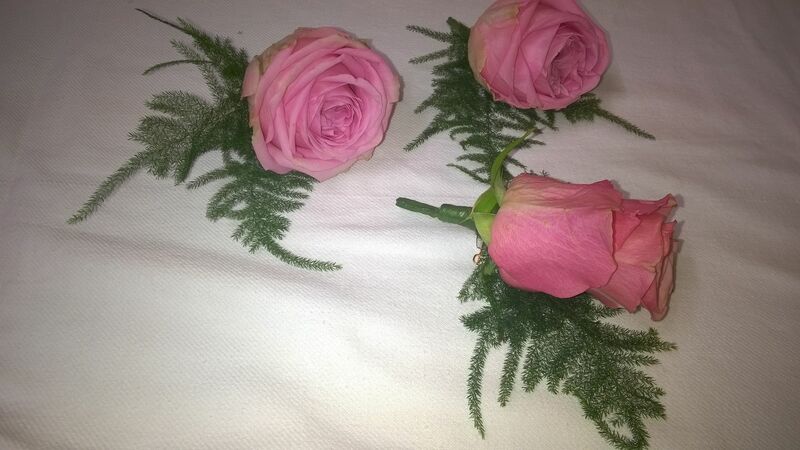 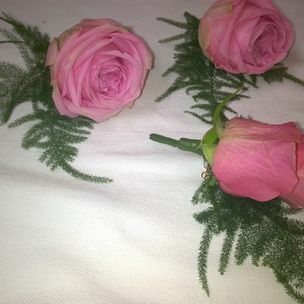 Button holes for the men were a single silk rose flower . 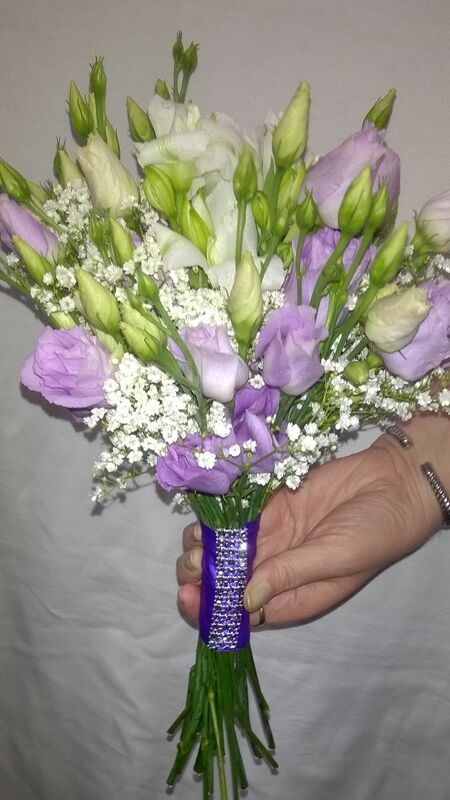 The twist was after 7pm the bride and groom with their wedding guests will start celebrating the Grooms 50 Birthday . 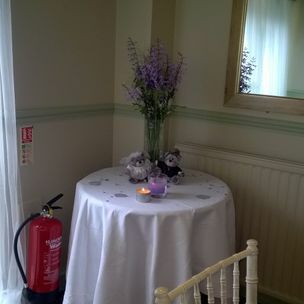 A themed fancy dress birthday party . 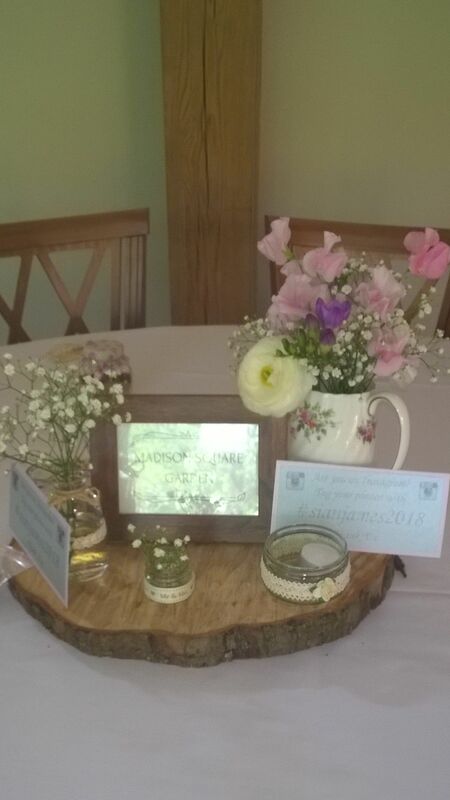 The English Vintage Country Garden , Rustic , with the natural Wedding Theme . 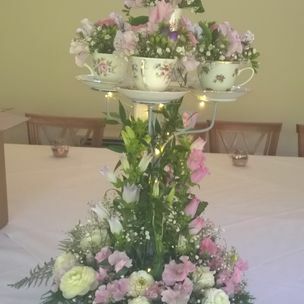 This May Bride loves going out for afternoon tea and a slice of cake . 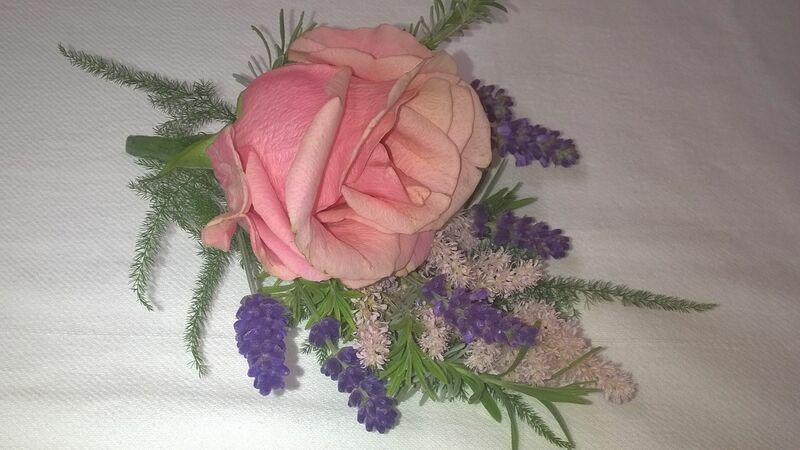 She loves the beautiful English country garden with its divine flower smells . 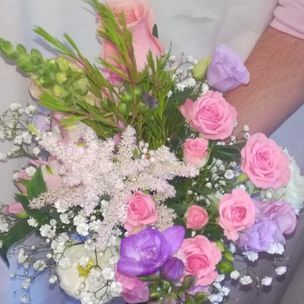 She wanted the look as you have picked the flowers from her garden and placed them in no order . 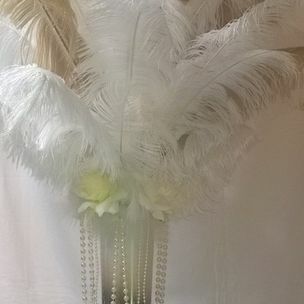 it could be dressed up as much or how little as you wanted . 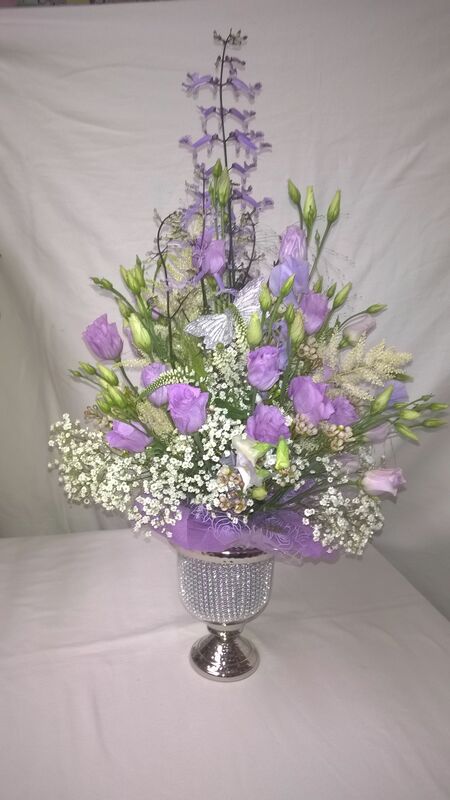 The colour theme Silver with shades of purples , dusky pinks to shades of pinks with white . 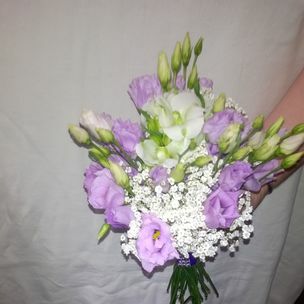 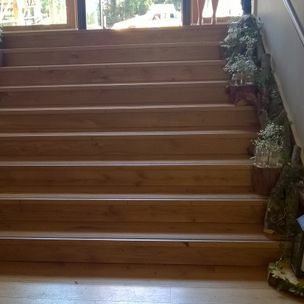 This bride wanted her flowers in fresh and wanted the scents too .